There are several places to see in Hyderabad one of them is Chowmahal. The "Chow" means "Four" and "Mahal" means Palace, therefor it means Four Palaces. The Chowmahalla complex which is a replica of the Shah’s Palace in Teheran, Iran today consists of two courtyards with elegant palaces, the grand Khilwat (the Durbar Hall), fountains and gardens. Its just 15min walk from "Charminar". 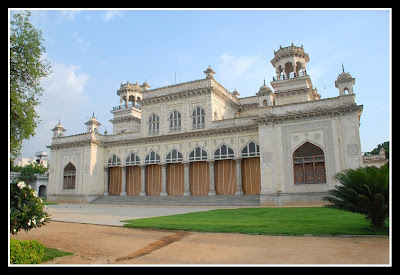 I visited this palace the same day when I visited "Charminar" (see my previous blog entry). From Charminar you have Mecca Masjid, just after the Masjid is a path on the right hand side, just follow it, that will lead to this palace on your left side. I should have covered this palace first then the Minar as closing time of this palace is 5.00 pm IST and there are plenty of things to see inside.The entry fee is Rs 25 per person and they charge Rs 50 for camera (well I don't go any where without my camera so if it was Rs 100 I would have paid it. ).